Erected by JAMES MONEY in memory of his three children LIZZIE, TOMMY and AGNES who died in infancy. Also his son THOMAS who died 24th April 1870 aged 18 years. Also of his daughter MARY who died 6th February 1885 aged 39. His son ROBERT who died 16th August 1887 aged 27. The above JAMES MONEY died 5th October 1895 aged 78. 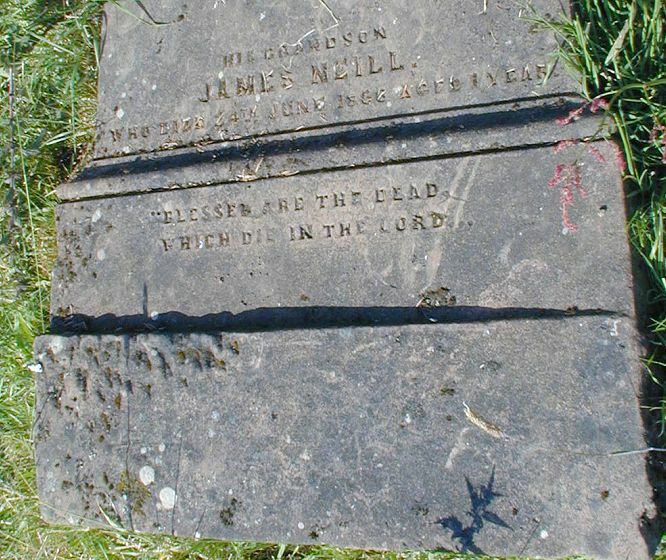 His grandson JAMES NEILL died 24th June 1868 aged 1 year. Blessed are the dead who die in the Lord. 1. Thomas MOONEY was a Farmer. +2 i. James MOONEY (born about 1822). memory of his three children LIZZIE, TOMMY and AGNES who died in infancy. the dead who die in the Lord. 3 i. Elizabeth MOONEY died INFANCY. 4 ii. 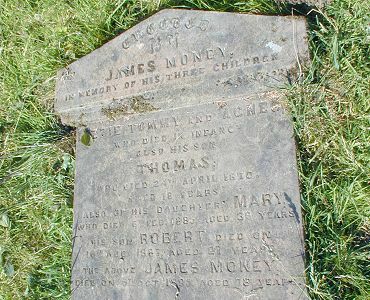 Thomas MOONEY died INFANCY. 5 iii. Agnes MOONEY died INFANCY. +6 iv. Mary MOONEY (born about 1847). 7 v. James MOONEY was born about 1851 in Ireland. 8 vi. Thomas MOONEY was born about 1852. He died 24 APRL 1870. He was buried in Kirkbride Churchyard #24. 9 vii. Jane MOONEY was born on January 17, 1860 in Parish of Maybole, Ayrshire. 10 viii. Robert MOONEY was born about 1860. He died on August 16, 1887. He was buried in Kirkbride Churchyard #24. 11 ix. William MOONEY was born about 1862 in Parish of Maybole, Ayrshire. He was a Grocer (1881). 12 x. Elizabeth MOONEY was born on October 25, 1865 in Parish of Maybole, Ayrshire. 6. Mary MOONEY (James-2, Thomas-1) was born about 1847. She died on February 6, 1885. She was buried in Kirkbride Churchyard #24. 13 i. James NEILL was born on June 24, 1867 in Parish of Maybole, Ayrshire. He died on June 24, 1868. He was buried in Kirkbride Churchyard #24. 1. Death Certificate #473 of 1895 at Ayr, Ayrshire. 2. Marriage Certificate #10 of 1867 at Maybole, Ayrshire.